Spanning 50 feet along a stunning cliff’s edge, Mesa Arch is easily one of the most recognizable landmarks in the national park system. 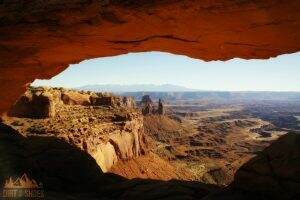 What most people don’t realize is that it is in Canyonlands National Park (not in it’s neighbor Arches) and that all it takes to see this gorgeous view is a half an hour and a mild walk from the parking lot! Mesa Arch is undeniably one of the most popular places to stop in the Island in the Sky District of Canyonlands — and for a good reason. The magnificent backdrop is perfectly framed by the forces of nature and the view will leave you breathless! The trail to Mesa Arch is a loop trail and is extremely easy to follow. As you begin the hike from the parking lot, the trail will offer you two options — one path straight ahead and another to your left. It doesn’t really matter which direction you go. Either way you’ll gain some elevation as you head up the hill! 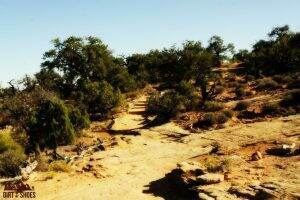 In the picture below, you can see that the trail itself is a combination of dirt and slickrock, with a couple of staircases made out of rock. After a quick climb to the top of the hill, you’ll start to descend toward the edge of the cliff. 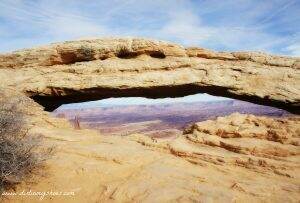 This is when you will likely get your first glimpse of Mesa Arch! A few more steps will bring you to the base of this gorgeous arch, which is perched delicately above a 500 foot vertical drop to the canyon below. This is the part of the hike where you will want to carefully watch your children as you enjoy the view. The view beyond the arch is phenomenal! The stunning canyons of the national park decorate the ground below, and the dramatic La Sal Mountains can be seen along the horizon. The iconic photos of Mesa Arch are usually taken at sunrise, which is the most popular time to view this east-facing arch. The lighting at sunset also puts on a nice show. Regardless of when you go, you are guaranteed dazzling views of a gorgeous landscape! After soaking in the views, complete the loop to return back to your car. The hike to Mesa Arch is 0.5 miles round trip and gains 65 feet of elevation, classifying it as an easy and family-friendly trail. 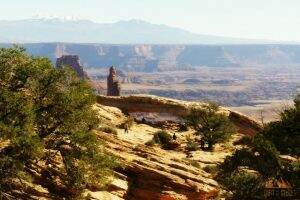 From the Island in the Sky Visitor Center, drive approximately 6 miles until you see the Mesa Arch Trailhead on your left. If you reach the intersection in the road that leads to the campground, you have gone too far. 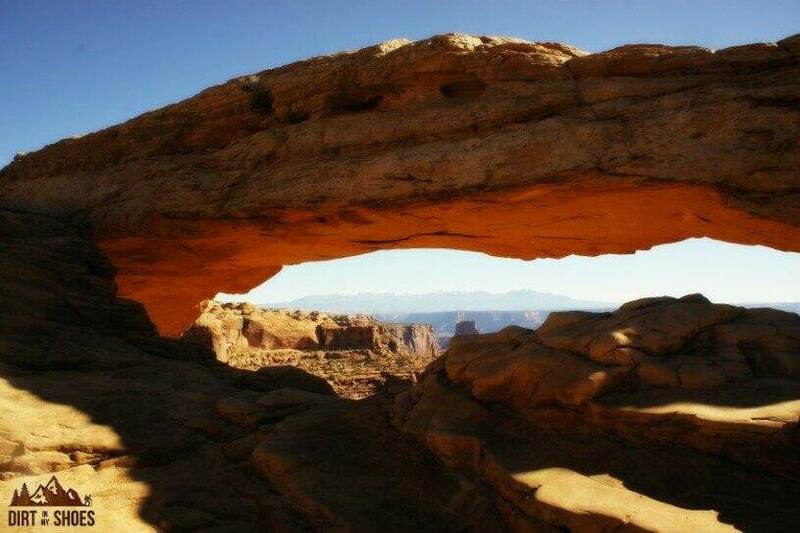 Click here to discover 9 more amazing things to do in Canyonlands National Park!! Thanks for sharing this information. Hopefully you get a chance to share some of your favorite trails on Trailsnet.com. Feel free to link back to your website when you do.